5-star-hotel in the 6th district of Budapest. The hotel has 69 rooms. Welcome to Mamaison Hotel Andrássy Budapest. This high-end boutique hotel is located on the historic Andrassy Avenue, known as the Champs Elysees of Budapest and a UNESCO World Heritage Site. Within walking distance you can reach the famous Heroes' Square (about 15 minutes) and about 3 km from the well-known Vaci utca with its many shops, shops and restaurants. The nearby Széchenyi Thermal Spa (about 10 minutes on foot) is the perfect place to relax. This little gem of a hotel, located in an amazing area close to the Heroes Square on the exclusive Andrássy Avenue -called the Champs Elysée of Budapest- which is part of the World Heritage. 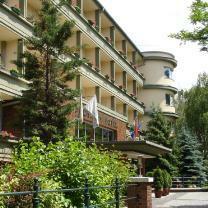 It is easy to find, as the hotel is situated approximately 30 minutes" drive from the Budapest International Airport. Taxis and special shuttle services are available from & to the airport. In the elegant historic setting of Andrássy Avenue, enjoy unique meetings and events at the Andrássy Hotel and the Kogart House. Ideal for high profile company and product presentations, fashion shows, cutting edge board meetings or out of the box incentives, our combination of luxury accommodation and culinary art, together with elegant function rooms, will stimulate any event into a success. Our Hungarian young Chef, Norbert Biro, mixes art into his culinary creations, presenting beautiful and colourful dishes and concentrating on every small detail to give each dish its own identity. Seafood is emphasized, without forgetting the abundant production of meat, poultry, vegetables and fruit from the rich Hungarian soil. Some of Norbert"s recent creations : saffron fish soup with mixed grilled seafood and toasted spicy almonds, tiger prawn tartar served in stuffed rice paper roll with mango papaya salad and guacamole, squid ink risotto with grilled scallops and baby vegetables. Along with fresh breads and desserts prepared by David, Baraka is a true culinary experience.